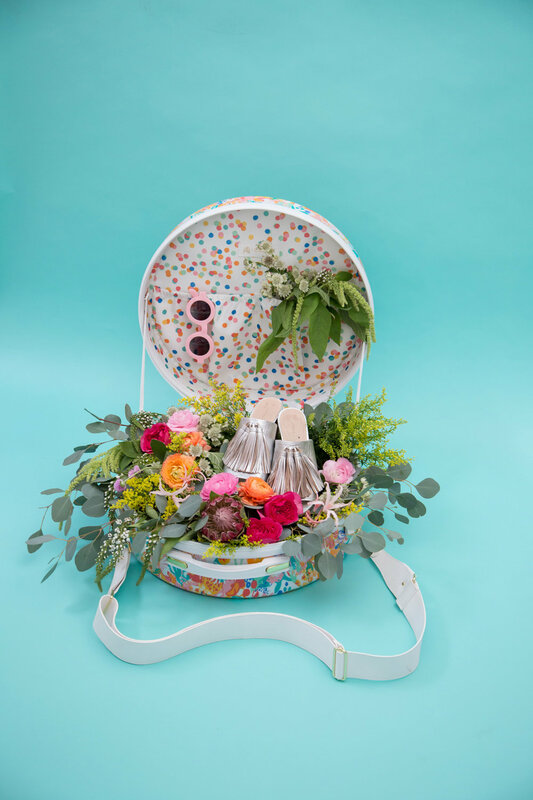 When it comes to living life in technicolor, you can expect queen of creativity Joy Cho to whip up the perfect DIY creation to set the stylish scene. (Seriously, can we talk about this incredibly inspiring space?) Before she became a mama of two, Cho started a little blog for sharing her daily design inspo, crafty tutorials, and tidbits of her life as a graphic designer in Philadelphia. Thirteen years later, Oh Joy! has become a full-on design studio and lifestyle brand, complete with shoppable products for every aspect of life. The Fashion Mamas LA member's latest endeavor? A colorful travel collection for Calpak created with playful adventures in mind. 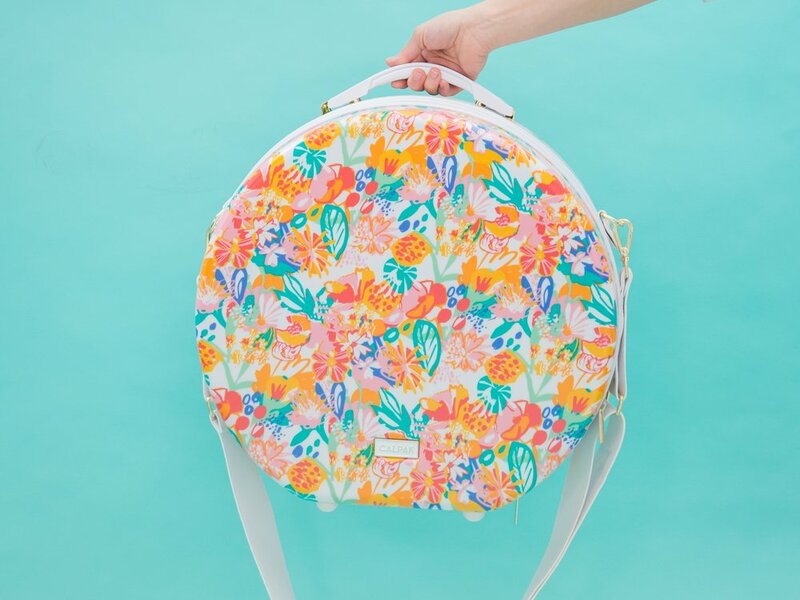 Priced from $48 to $385, the range includes packing cube sets in three printastic options, a floral hatbox, and a carry-on and medium and large rolling luggage available in a sunset-inspired palette or confetti pattern. Here, we sat down with Cho to find out how she linked up with the Cali-based travel brand, how she stays inspired, what many don't know about how she nabs her big-name collaborations, and the steps that designers and entrepreneurs can take to snag the partnership of their dreams. Read on below, then shop her collection at Calpak's website and select retailers, including Nordstrom, Shopbop, and Urban Outfitters. Live in LA? Shop the colorful line IRL and meet Cho at her trunk show this Saturday, January 27 at Nordstrom at Americana at Brand. The event runs from 2 to 5pm; swing by between 3 to 4pm to meet the designer herself as she meets and greets shoppers. First, how did you connect with Calpak? In the fall of 2016, I got a suitcase from CALPAK and fell in love with it. I thought the quality was amazing, it was so light, yet tough, and it had the best roller feel for any other suitcase I had ever tried. I pitch to brands often to partner on design collabs, and after trying out their luggage, I contacted them immediately to convince them why we should work together! We met up soon after and then immediately began the process of designing and creating a collection which took a little over a year. What was the inspiration behind the designs, and were there any particular adventures that you had in mind when designing them? You don’t see suitcases with patterns very often, so it was important to me to make sure the patterns were ones that someone would love to use for a long time to come. Since we wanted to make the patterns feel like a timeless version of Oh Joy, the prints were based on optimism, joy, and the idea of bringing the party wherever you go. Therefore, a playful confetti, a fun floral, a serene ombre sunset, and a colorful stripe worked together to make a statement without being too seasonal. I’m heading to Hawaii with my family for spring break and the sunset one is perfect for that! We're so inspired by your creativity, but we're curious: How do you stay inspired? Oh, that’s so hard! I think it’s about always discovering new things around me — going to fun places with my family and creative inspiration spots with my team. More than anything, I have to get out of the house and get out of the office and change up my routine to keep things fresh. You've also snagged deals with some major brands, including Target (swoon!) Can you tell us more about your process of pursuing partnerships? When it comes to licensing and product partnerships, I go after about 80% of them. You can’t wait around expecting a brand to come to you. So I have my brand deck up-to-date always. And when I come across a company that makes great products and seem in line with my vision and audience, I will reach out and make a pitch! Many people would be surprised at how often you reach out to brands directly. How do you think has this contributed to your success? I think that brands either (1) don’t think that someone might be interested in working with them and therefore haven’t made the attempt themselves to reach out or (2) haven’t thought about a collaboration previously and an email put it in their brain. What are your top tips to other designers and entrepreneurs looking to lock down the partnership of their dreams? 1) Research the brand. Get a sense of their style and if they have done collabs before or not. If they have, see who they have worked with you. Your style should compliment without feeling too similar to their past projects. If they haven’t, you may not have a basis for comparison but you could open their minds to the possibilities. 2) Make contact. Whether it’s through an email address found on their website or a DM through Instagram, find out the best contact. 3) Send your pitch. The initial email should be short and sweet stating what you do, why you want to work together, and what you bring to the partnership. If they are interested, be prepared to send a brand deck with more detailed information and/or get on a call to talk further!